A swirl of flavours for this Dammann Christmas herbal tea : lemon balm, cocoa, ginger, cloves, cinnamon, black and pink pepper, cardamome. Treat your tastebuds for Christmas with this gourmet and spicy Dammann herbal tea: lemon balm, cocoa beans, ginger, cloves, liquorice, cinnamon, black and pink pepper, cardamome. Dammann Freres has been faithful to the tradition of specialty teas since 1925. The tea brand has earned worldwide recognition quite early. Dammann Freres experts have been seeking the best blends and the most subtle flavours for generations: a quest for perfection whose single purpose is the satisfaction and pleasure of all tea lovers. In 1980, Dammann Frères invented the Cristal® bag: the light, thin transparent fabric shows the carefully selected tea leaves unfolding when brewed. The Cristal® bag makes each cup the perfect brew and allows enhanced tea flavours. Dammann created a savoury and classy selection of both traditional and bold tea blends, such as green teas, herbal teas, Carcadet and Rooibos. As real tea connoisseurs, Dammann tea experts select tea upon its colour, shape and regularity of the leaves, and then classify the smoothness, strength, bitterness and flavours of the tea. Retro-olfaction (when exhaling air through the nose while maintaining the tea in the mouth for a little while) opens on new, original flavours. The tea flavours may be classified as such: bitter, tangy, salty, sweet and umami (a Japanese word designating savoury flavours). Dammann strives to develop the best quality teas to offer the best floral, vegetal, woody or fruity flavours. Its creations open on new worlds of sweetness and vitality, with bold and comforting flavours and aromas that capture the mind. A unique occasion to share the most unforgettable moment. Discover also: The Carnets de Voyage autour du Thé (The Tea Travel Books) from Dammann Freres. 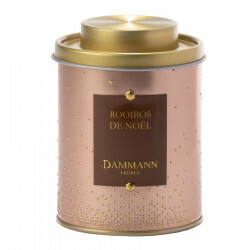 Tasty rooibos perfumed with Christmas spices, exclusive creation of the Damman house. Ingredients: cinnamon, lemon balm, cocoa beans, cardamome, ginger, pink pepper, chocolate flavouring, cloves, flower petals, black pepper. Steeping time: 6 minutes / 100°C. Best before: see date on pack.